Around the country, communities are demanding progress on the issues that matter to them. A democracy crippled by special interests and corporate influence can’t achieve this progress. Climate denying corporations and individuals are fighting against the changes we need by funneling money into political campaigns. It's time to take back the system. 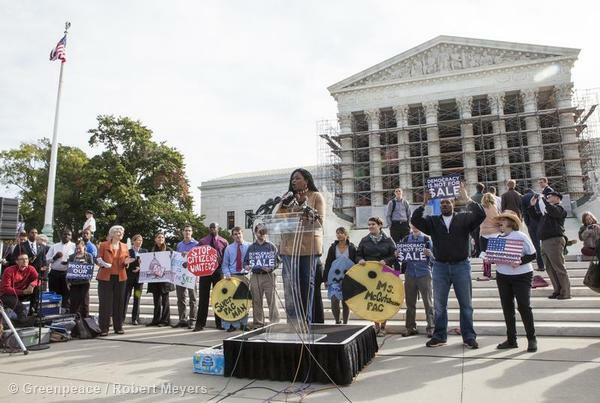 Yara Allen of North Carolina's Moral Monday movement sings outside the Supreme Court as the court arguments in McCutcheon versus the Federal Elections Commission. The petitioners ask the Supreme Court to strike down the overall, or aggregate, limits on what an individual can give to all candidates and parties in an election cycle. Every year, fossil fuel corporations like Shell, BP and ExxonMobil and people like the Koch brothers make billions by maintaining the status quo. But this extent of corporate influence in political campaigns and decision-making is fairly recent. The 2012 election was the most expensive election in U.S. history, with more than $7 billion dollars spent at the federal level alone. So, how did it get this way? And how can we stop it? In 2010, the U.S. Supreme Court opened the door for unlimited political spending by wealthy individuals and corporations. This has allowed big polluting corporations to funnel money towards political candidates who will do their bidding—often using “dark money” front groups that don’t disclose where their funding comes from. Since the Citizens United ruling, corporate interests have spent billions backing political campaigns, and they’re spending more every day. Fossil fuel companies in particular are spending huge sums of money to make sure politics favors the polluters. Unlimited corporate money in our democracy means that the people’s interests are being drowned out, but it doesn’t have to be this way. 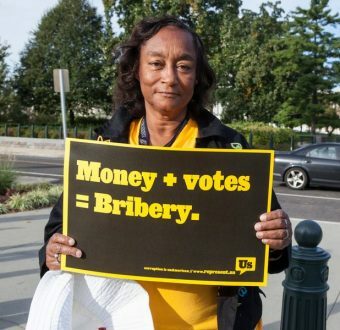 The Citizens United decision was a bad call for our democracy, and it’s got to go. Then there’s ALEC, short for the American Legislative Exchange Council. Since 1981, ALEC has convened corporate lobbyists and state lawmakers in secret meetings to draft “model bills” that benefit corporations at the public’s expense. One in five of these bills eventually makes it into law. ALEC is funded by big polluters like ExxonMobil, Shell, Chevron, and the Koch brothers, and its number one purpose is to serve their interest. Laws written by ALEC have reversed state targets on renewable energy, prevented the regulation of toxic coal ash, and turned over millions of acres of public land for exploitation, in addition to mandating voter identification laws that disenfranchise voters. Find out how you can help kick corporate money out of politics.